Our customer is one of North America’s leaders in Automotive parts and products manufacturing and had expanded into a line of belt tensioners. Over the decades, they had provided automotive products to many different automotive divisions and were known for establishing new standards for quality and value for their clients. As they entered the belt tensioners market, designing a lighter, more efficient and cheaper solution was the goal. The spring components for the belt tensioners needed to also be lighter, more efficient and cheaper. Their design utilized a spring loaded in the reverse direction, which was a unique use of a torsion spring, and farther demanded the evaluation of special processing and material specification. They required evidence that the part would exhibit the required functional durability. 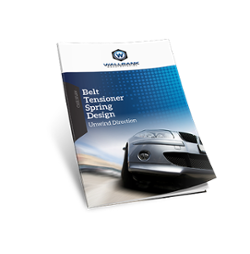 Complete the form on the right to download your copy of “Belt Tensioner Spring Design Case Study” to find out how Wallbank’s design was more affordbale for the client and overachieved their expectations in quality.